BEHIND shophouses selling designer furniture and Italian cuisine lies a maroon leather chair, a cracked mirror and a marble-finished cabinet. At this back alley of Tanjong Pagar, a sturdy green canvas tied to water pipes and air-conditioning grills shield the trio from the afternoon sun and the gaze of the financial district’s skyscrapers. The Made-in-Japan chair sits along the alley’s double-yellow line, a traffic marker that prohibits parking. But street barber Lee Yoon Tong insists the relic from his former salon is not going anywhere else. Seven years have passed since the bespectacled 70-year-old moved his salon here. He was evicted from a shophouse around the corner when its rent shot up after redevelopment. Today, a firm selling overseas holiday homes occupies his previous unit while Lee continues to ply his trade in the alley. Out here, he uses a battery-operated shaver instead of an electric one. In place of running tap water, he fills bottles at the neighbouring coffeeshop daily. While his revenue has fallen – he earns over $700 a month as compared to $1,300 previously – his costs have dropped even more. With no rent, no taxes and no utility charges, this way of making a livelihood is less stressful, he says. Running a business on the streets was a way of life in early Singapore. Back then, a pushcart was all one needed to hawk food or services. Today, only state-licensed ones like Lee can do so. The National Environment Agency (NEA), which oversees licensing, says only one in five applicants was successful last year. To be eligible, one has to be a Singaporean above the age of 45 and struggling financially. The NEA then proceeds to negotiate with the applicant’s town council and respective landowners to determine what he can sell, and where. Apart from the monthly licence fee of $12, street hawking is rent-free. Crouched over his customer’s black leather heels, Lee sits on the outside corner of a bank. The lunchtime crowd from the nearby financial district throng the walkway where he has set up shop for over 20 years. The 84-year-old’s legs are tightly bound to his wooden stool and if stretched, they extend beyond the white canvas sheet he has laid on the floor to mark the boundaries of his stall. To the nearby shop owners, Lee’s restraint is a far cry from the past. The cobbler used to leave shoes lying around, where they would mess up the area and cause a stench. It was only after a member of the public complained to the authorities that he cleaned up his act. “Did they send you?” he asked when first approached, glancing at the adjacent shops because he suspects the owners are plotting against him. Such paranoia, he explained later, is because he is afraid to get into trouble with them as it might cause him to lose his licence. Recently, he even painted his wooden tool cabinet a striped pink and red to complement the doughnut shop’s façade in the hope of appeasing them. The shop owners are resigned to Lee’s presence. “If we argue with him, we’ll definitely look like we’re bullying the elderly,” says one who had requested for anonymity. Her previous tenants had complained and even moved out because of how unsightly the cobbler was at their shopfront. But rent has remained unaffected and that alone holds this fragile truce. While some see newspaper vendor Rennie Teo and his wife as an obstruction to traffic, others say they bring life to “dead” spaces like this linkway. Unsightly, unhygienic and being an obstruction to pedestrian traffic are the top complaints that NEA receives regarding street hawkers. Such concerns are why the Land Transport Authority (LTA) rejected Rennie Teo’s recent application to sell newspapers along its pedestrian linkway at Boon Lay train station. Linkways are built for people to get from one point to another quickly, says the agency’s representative. For this reason, LTA rejects all street hawking applications, which it receives regularly, and refers the applicants to open spaces in town centres instead. Yet, in cities like Bangkok and Taipei, street hawkers are welcomed for making places not “just liveable, but lovable,” says Professor Ooi Giok Ling. The author of Future of Space, a book about urban planning in Singapore, explains, “Street hawkers add a lot of colour and sensory pleasure to the experience of walking along the streets, so it’s not just seeing the city but sensing it in every sense of the word.” The urban planning expert from Nanyang Technological University also feels that LTA’s stand has made linkways into such sterile environments that people rush through from point to point. Despite the latest rejection, Teo continues to sell newspapers at the linkway illegally, as he has been doing in the vicinity for the last decade. Two years ago, NEA requested for him to be licensed but both his location choices, in the nearby bus interchange and train station, were rejected. The bus interchange currently has two rent-paying newspaper kiosks. The train station owner SMRT Corporation, on the other hand, suggested that Teo rent its retail spaces alongside companies like 7-Eleven and Ya Kun Kaya Toast. But Prof Ooi argues that street hawkers run small businesses that do not need and cannot afford such spaces. They usually occupy “dead” spaces – or areas that landowners find difficult to utilise because of their small size – so why not let them bring these spaces to life, she suggests. “If you keep thinking about the highest rate of returns, then it actually narrows (land use) to a very small set of activities,” says urban sociologist Ho Kong Chong. Street hawking circumvents rent and big capital, allowing anyone to get in and out of business easily, he adds. In 1994, the government stopped issuing new street hawking licences in an attempt to clean up the city. But the policy was reversed after the economic downturn of 2000 as the government recognised the trade’s ability to withstand fluctuating economic conditions. That helped people to cope with tough times. 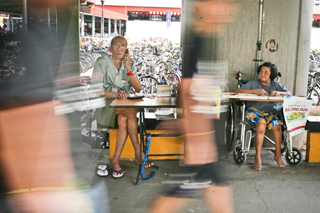 Even so, street hawking today should remain only as a last resort for the needy, NEA maintains. Heavy regulation of street hawking was necessary to make Singapore the beautiful city it is now, says MP Foo. Plus, the state currently has many other welfare schemes and Singaporeans should re-train themselves for a job, he adds. While individual cases matter, MP Foo believes that they should not forget the larger picture. “In the end, the economics rules,” he says. Before barber Lee was evicted in 2002, he operated in the same shophouse for 14 years and last paid a monthly rent of $475. Since then, succeeding tenants never stayed longer than a few years. The latest occupant, a firm that sells luxurious holiday homes, is now looking to rent out a portion of their office space. Their asking price? $7,000. Now, that’s economics for you. Farmlands are also subjected to market forces. The farmlands in S’pore produces only 20% of vegetables supply. Although it is the Government’s intention is to increase the number, on account of the current highest bidder system and lack of farm subsidies, this figure looks set to drop further. New rural areas released by the Government are subjected to the bid system. The highest bidder would be more likely to convert these potential farmlands into countryside resorts and leisure fishing grounds to generate higher returns. The local farmers can’t compete with the cheap produce from Thailand, Indonesia and Malaysia. If there are farm subsidies in place, the scenario would be different. Local food production should be encouraged because there will be less food miles; distance from farm to kitchen. Also, an eye on pesticide usage would be possible. This reduced dependence on outside food supply vis-a-vis highest possible return on land use is a decision to be made by policy-makers. They have been leaning more to the latter, unfortunately. "Land is a premium in Singapore, but this premium is surely also restricting a fuller range of activities. Surely we can allow for more diverse land uses of varying rates of returns..."